When I am asked what I do for work, and I get to tell people that I am a wedding photographer I can’t help but smile! 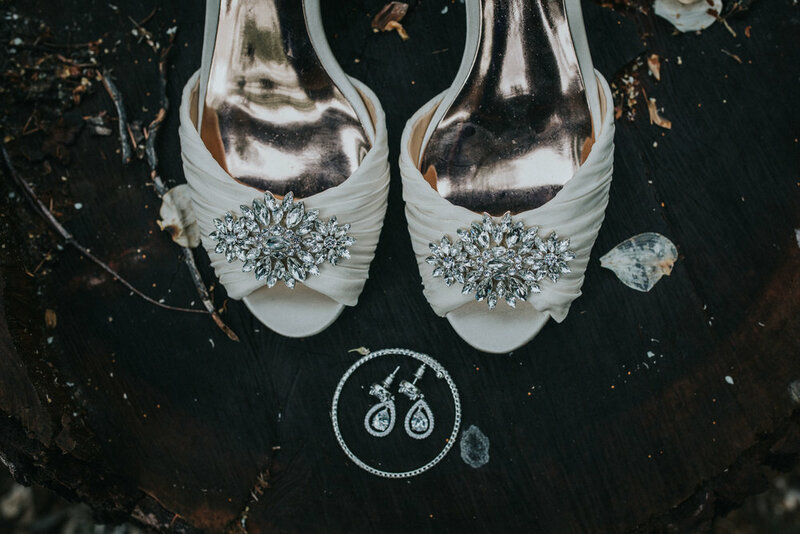 I am elated to be what is considered one of the most important vendors on a wedding day. This supporting role in other’s happiness is important to me. Not everyone gets to love what they do, and I know it is a major blessing! 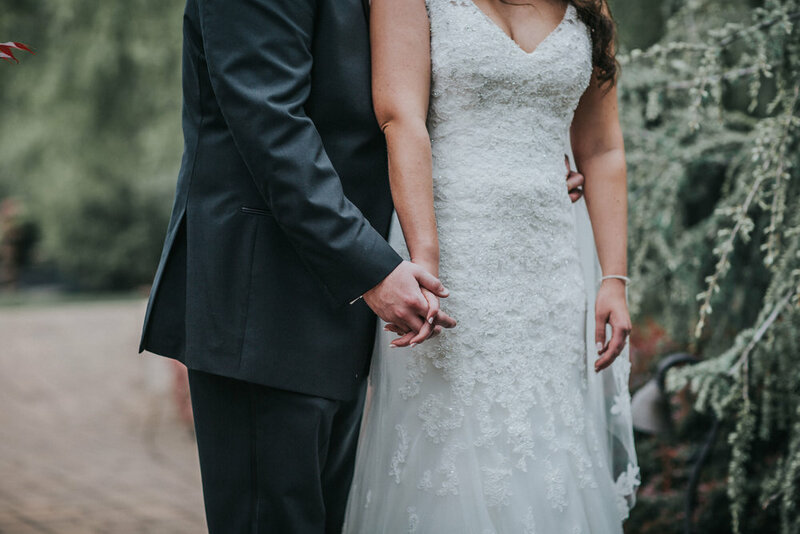 I smile when I speak about my work because I am thinking of my couples (who become such great friends) like Faith and Jake and the lasting memories made in one day. Faith and Jake’s Brigalias wedding day included many heartfelt moments, family traveling from Sweden, and a lot of dancing! Let us think back to May 4th and 5th. Do we remember the wall of humidity that rendered showering useless, or the constant monsoon we were living in? I bet Faith can recall it well, and the feeling of uncertainty the morning of her wedding as she was getting her hair and make-up done! As I arrived to her childhood home and parked my car in a one foot puddle of muddy grass, I grabbed my gear and realized the rain stopped, sun was shining just right…there wasn’t a cloud in the sky (Thank you Wedding Gods). I said to my assistant, “Let’s do this!”. It seems that sun on your wedding day is just as lucky as rain on your wedding day! Details, Gorgeous Farmhouse and Video Games? Faith got ready in the home she grew up in. This is always special and sort of symbolic on a girl’s wedding day! 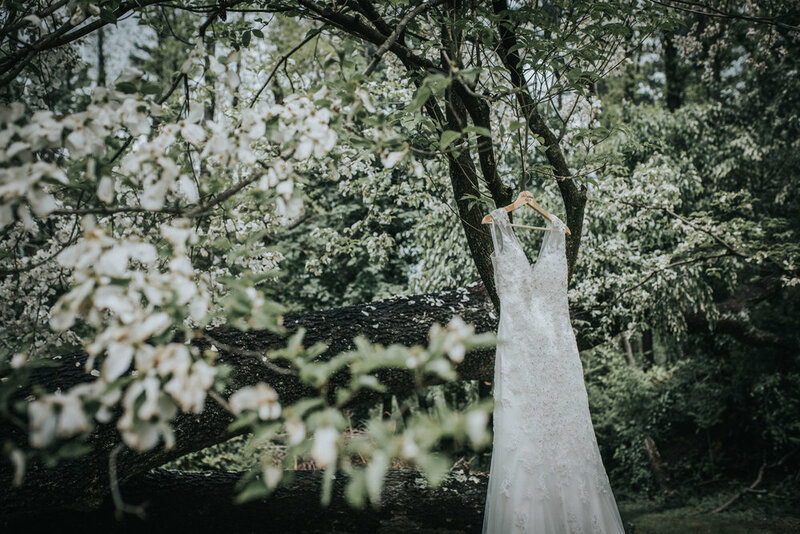 This farmhouse-chic home provided stunning natural scenery in it’s own backyard for Faith’s detail photos such as the lovely, all-white bouquet by Rose Perri as well as her bridal gown designed by Sophia Tolli. The space in the home let the soft natural light pour in through the windows to hi-light Faith’s beauty and complete bridal look! 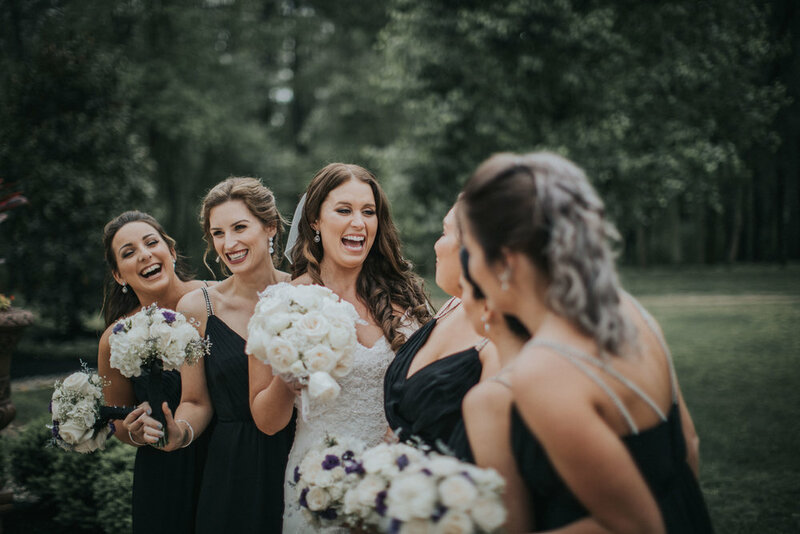 Faith’s girls were laughing with excitement and in awe of how gorgeous their friend looked. 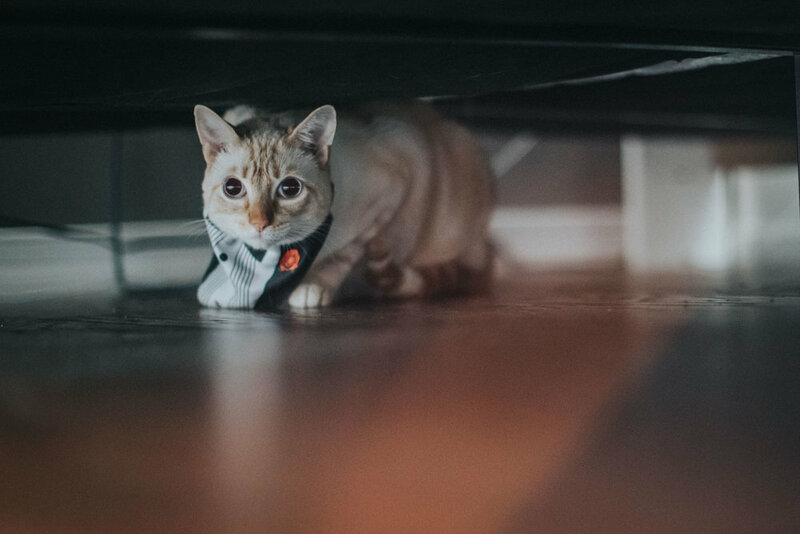 Her mother and mother-in-law were both feeling the emotions….and the family cat was hiding from the intruders! As I captured the girls getting ready, my second photographer was SO busy with the guys. Can you sense my sarcasm? You know, I realized while editing that nothing (aside from his bride) brings a natural smile to a groom’s face on his wedding day quite like a round of Madden with his boys. I love the child-like spirit men acquire as they toast to the couple and get ready via a YouTube video on “How to tie a tie”. With the support from his Dad and guys, Jake was ready to head to the Chapel! This moment is always important! It happens so quickly and without fail, turns out to be so worth the planning. Jake took one look at his wife-to-be and felt like the high school boy he once was when he fell in love with her all over again. After they admired one another’s wedding day look, we took advantage of the grounds at Brigalias to capture a few portraits. Sometimes a moment during a wedding will stop me in my tracks and tug at my romance-loving heartstrings. During the ceremony, it was when the officiant emphasized the importance of May 5th to Faith and Jake as it also marked the date they started dating in high school. I thought to myself that this was another way the two made this day even more so about their entire relationship’s story, and that was important! After the “I-do’s” and the kiss, these two were finally now one. Mr. and Mrs. Wethman made quite the entrance into their ballroom onto the dance floor when they embodied T.I and kicked off the party to "Bring Em Out" with a little help from DJ Perry Angelozzi! The room was buzzing with celebration, and then they slowed it down a bit to hold each other during their first dance as husband and wife. 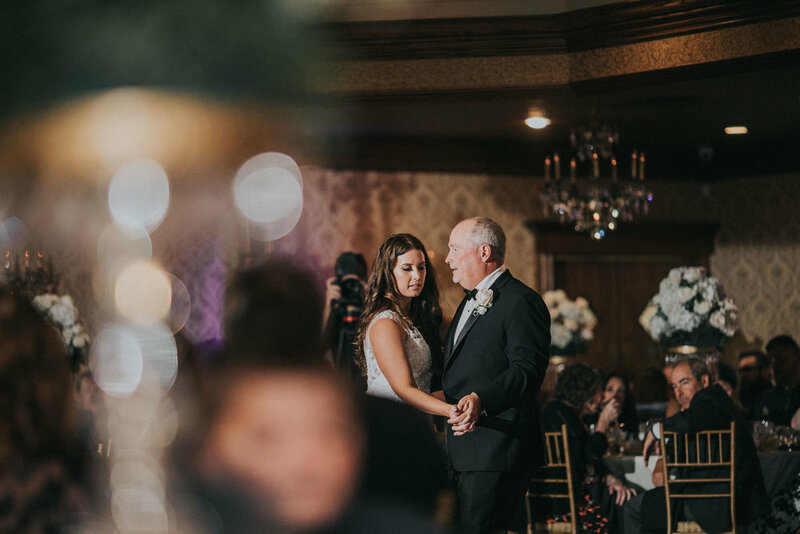 In a room full of over one hundred guests, they were alone as they danced to “Can’t Help Falling In Love”…a song with just the right combination of words to take the guessing out and explain that some things are meant to be! Three emotional toasts, including one proud blessing from Faith's dad were further indication of how loved the newlyweds are, and how much happiness everyone around them wants for their marriage! Congratulations Faith and Jake! Thank you for inviting myself and my team into your lives to be a part of this day. You had a beautiful start on your journey together as husband and wife!